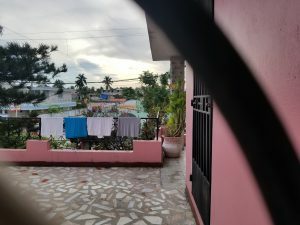 I have returned to Haiti! With me are Professor Giles and a small group of 3 other UML students; Paul Salibe, Nicole Belanger, Alanna Grondine, all of whom are a part of the Senior Haiti Capstone Project. 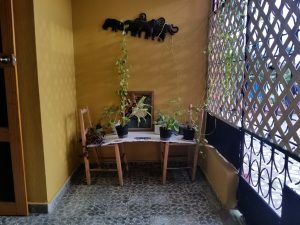 We arrived around 4 P.M on March 11th to the Haiti Development Studies Center and quickly made ourselves at home. 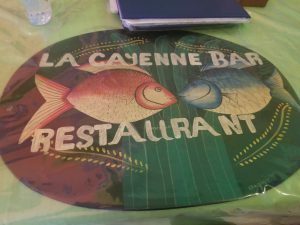 We spent the first two days exploring Les Cayes and even stopped at a local restaurant. Place mat at the La Cayenne Restaurant. 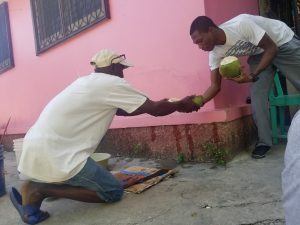 At the study center yesterday, Anous, an employee at the HDSC, treated us to coconuts he gathered from the tree right in the back yard. 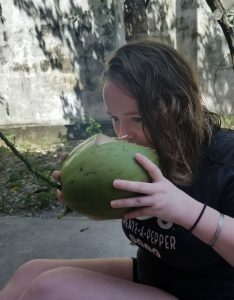 Me, awkwardly figuring out how to drink coconut milk straight from the source. 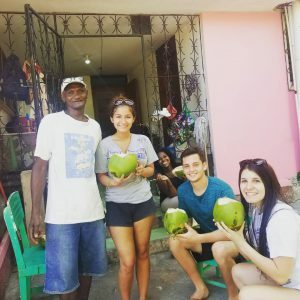 Anous and UML students enjoying some coconuts! Today we were able to participate in a teaching workshop at Sainte Maria Des Anges (Saint Marie School of the Angels). 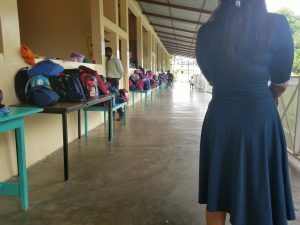 We visited this school in January and were given a tour of the campus. It is a private school with a very impressive structure and new developments in construction. This time we were able to be more interactive with the students. We assisted Dr. Giles’s 2-hour lecture on RC circuits. We spent time yesterday and this morning practicing the set up before hand so that we were able to assist the students with their lab. Paul gathering data from the circuit analysis. 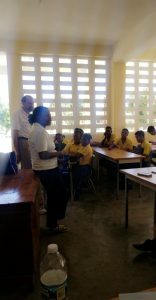 As we were helping the students we were able to also learn more for ourselves as well. There’s something about the practice of showing someone else how something works that really creates a better understanding for the teacher. In this case, us students being the teachers. Dr. Giles and Dayana talking to the class. The scene on the way to Coteaux. 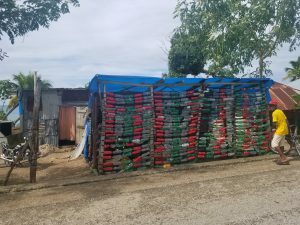 There were also many structures made from plastic bottles that I saw on the way. They were used as market stalls to sell goods and I thought it was a great way to reuse plastic waste. The next part of our adventure in Coteaux was more technical. 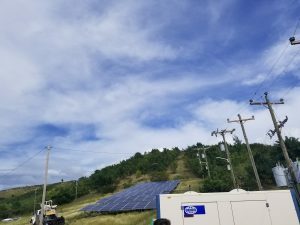 Coteax and two neighboring communities are run on a solar energy grid. The way people buy electricity is through a pay as you go system. You basically go to where the solar panels are, buy electricity, and then go home and punch in your card information to turn on the electricity. They also have a diesel back up generator in case the solar panels do not produce enough energy. They had several transformers to step up the voltages for delivery to the utility grid from the solar energy facility. 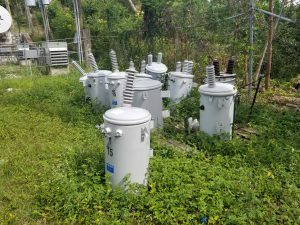 The transformers below were damaged by Hurricane Matthew. Today is the day I was really looking forward to. 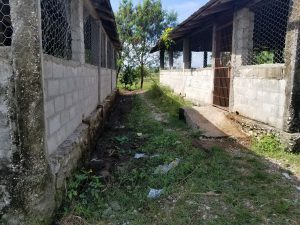 Pwoje Espwa is the agricultural teaching orphanage in Les Cayes and the place where our septic system design will be implemented as well as our biodigesters. 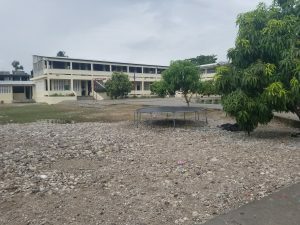 Once entering the grounds there is a long dirt road that leads to the orphanage. It is currently the 20th anniversary of the orphanage and there were banners hanging at the entrance. Sanitation and housing domes newly built at Pwoje Espwa. Cameron Parker is a director of Pwoje Espwa and since he isn’t in Haiti this week he connected us with his right-hand man, Ti Boss. Once we met with Ti Boss we went to go look at a current sanitary system they are building. Large septic tank not fully built with three chambers. It rained the previous day so there is water in the system. Then we headed over to the site where a new housing unit would be built in place of an existing one. 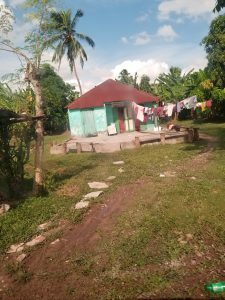 This housing unit is not technically a part of the orphanage but is a part of Pwoje Espwa’s outreach program to the neighboring houses. As of right now this is the site where the next septic design will be implemented. We took field notes and measurements of the site. Plot of land where the project will be implemented. The current house in the photo will be replaced with a bigger and better housing unit. We began digging a hole at 11:05 AM in order to conduct a permeability test of the soil. We filled a hole that was 17 inches deep with about 9 inches of water. We came back at 12:05 PM and measured the height of the water to be about 8 inches. Therefore we saw a water level drop of 1in/hr. Owen digging a hole for a permeability test. For the hour we were waiting for the water to infiltrate the soil we headed over to the pig farm where the biodigesters will be used. This is the sides of the pig farm. There are holes along the bottom where the waste gets flushed through. This then runs off into a composting pile. Waste drainage on the side of the pig farm at Pwoje Espwa. The Haiti Development Studies Center is located in Les Cayes, Haiti. Upon arrival this big large gate opened up for us and we all hopped out to check out our home away from home for the next week. The center is surrounded by concrete walls. Tobi the guard dog lives in the back and gets to roam freely at night when everyone is in for the night. He is strictly a guard dog and there is no petting Tobi. My room is on the second floor and I’m sharing Dayana’s room. Ralph and Dayana are both from southern Haiti and went to highschool right behind the study center. They were chosen to receive a funded Umass Lowell enrollment and now live at the study center. Both Ralph and Dayana are very smart and they are super cool to hang out with. They also help us translate when conversing with the staff at the study center. 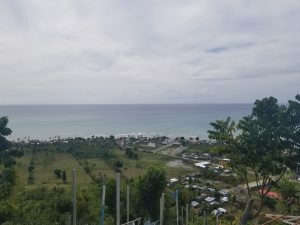 The view of Les Cayes from the center. •Be conservative with water. When showering only turn the water on when you need it to rinse. •Don’t drink the water from the tap and use the bottled water to brush teeth. • Don’t take any photos of people unless you have their permission. Sometimes people are going to end up in photos of structures or land but that’s ok as long as you aren’t deliberately sticking a camera in someone’s face. •Power comes on sporadically, so don’t leave electronics plugged in because the surge will ruin your devices when the power comes on. Nothing too crazy or unexpected. I’m so comfortable here and the food is AMAZING. Tonight we had goat with rice and it was so good. I will definitely miss having Haitian food every night. 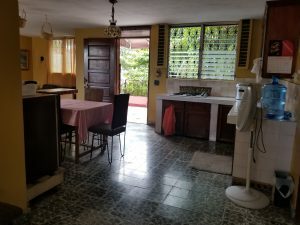 All of the meals are prepared by the staff and they put so much effort in preparing the meals. I will be looking forward to staying here again in the spring time. 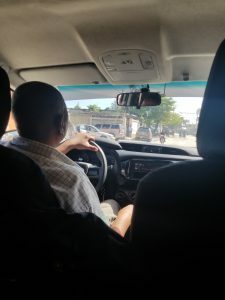 Yesterday’s drive in from Port au Prince was a lot to take in. We landed in Port au Prince and the airport was nice – it reminded me of the Miami Dade airport. Once we got off the plane I looked out of the window and saw these beautiful mountains. Once we left the baggage pickup and went outside we were bombarded with offers to carry our bags. We had to stay close and keep walking to find Stevenson, our driver and chief security at the study center. We followed Stevenson over to our van and so did a few young Haitians who put our bags in the van for us. 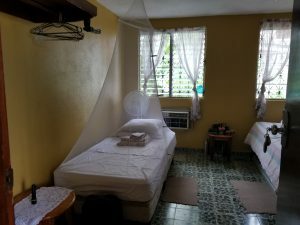 As I prepare my belongings and field equipment to travel to Les Cayes, Haiti I feel overwhelmed at the opportunity alone and excited for the cultural shock wave that is about to hit me. 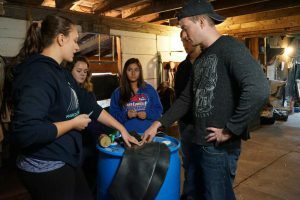 I transferred to UMass Lowell as a Sophomore and one year later during the Fall Semester of 2016, I met Michael Doane, who was working on a design for an anaerobic biodigester that can convert manure into methane gas and fertilizer. 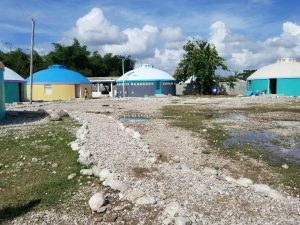 Biodigester-Aided Solutions in Haiti (B.A.S.H.) 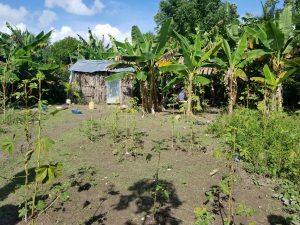 is a team effort that began as a 2016 DifferenceMaker project and continues the project through the university’s Haiti Development Studies Center. Michael was seeking new students to join BASH after previous members left the University. I joined and intended on contributing fundraising ideas in order to travel to Haiti and implement the biodigester. 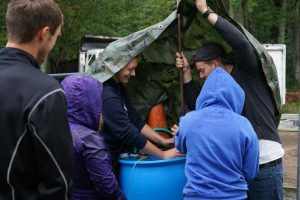 Working alongside Mike, other Juniors at the time (Nicole Belanger, Owen Gannon, Alanna Grondine), alumni Maureen Kelly, and Service Learning Coordinator Linda Barrington we set out to revolutionize the sanitary infrastructure in Haiti. With the position I am in as a student learning civil engineering solutions to worldwide problems, I felt like I found just the right spot for myself at this university, and I had. Maureen Kelly and Linda Barrington saw an opportunity to revamp the club, Civil Engineers for Change, as a platform for BASH and other engineering projects student wanted to become involved in. We dropped the “Civil” and became, Engineers for Change, and I was voted President! 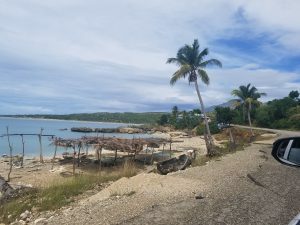 After fundraising and winning third place in the DifferenceMaker’s Engineering Prototype Competition, Nicole and Maureen traveled to Haiti in January, 2017 and came back with all the information we would need to continue the BASH effort. 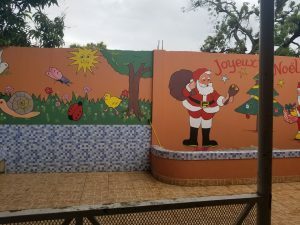 They visited Pwoje Espwa, an agricultural teaching orphanage in Les Cayes, Haiti that had an existing biodigester implemented. 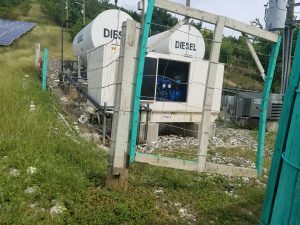 Unfortunately, the location of the biodigester was not in an area where enough substrate was accumulated in order to maintain anaerobic digestion. It was also mostly underground and definitely not going anywhere. The director of the orphanage thought that biodigester would be best utilized at the pig farm which had 20 pigs. Therefore, instead of taking the approach of repairing the existing biodigester, we were going to replace it. From there, we began to research current biodigesters that would be easily portable. With the money we received from the UMass Lowell Chancellors 2020 Grant, we procured all necessary parts and began fabricating our design. We worked together to build our pilot biodigester at Maureen’s farm in Ashburnham, Massachusetts. 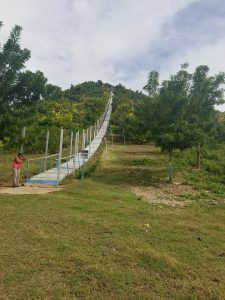 The design is composed of parts we believe can be easily acquired in Haiti and can be modified to interchange any components that we later discover are not accessible. Currently, we are researching enzymatic co-culture digestion regimes that can accelerate the digestion process within the biodigester, which in turn will accelerate the production of methane. 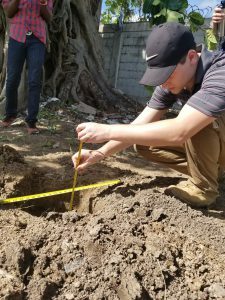 During Nicole and Maureen’s trip to Haiti in January, 2017, the director of the orphanage, Cameron, proposed the students take on a new project: a septic system for one housing unit that will be built as a part of Pwoje Espwa’s Outreach Program. Challenge Accepted. Since we had minimal prior knowledge on how to design a septic system, this was a good opportunity to propose an Alternative Service Learning Capstone for seniors in the department of Civil and Environmental Engineering. The Service Learning Capstone was approved and will be taught by Dr. Onur G. Apul in the Spring of 2018. The Fall semester of 2017 included a technical elective, taught by Linda Barrington, and included 12 students. 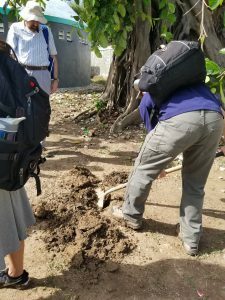 We learned about Haitian culture, U.S. septic design standards and Title 5, hydraulic conductivity tests of soil, cast in place tank designs, and so much more. I can honestly say I feel prepared to work with my team to engineer this septic system. It is taken for granted the high quality sanitation infrastructure we have in the U.S. and the fact that in this day and age so many people are living among their own waste is troubling. Many of these children at Pwoje Espwa have never used a toilet before and have never even sat down to use the bathroom before. The fact is that open defecation contaminates food and water sources and spread disease causing pathogens, such as Cholera. We have an opportunity to use the resources and education we have as students to help. It is true that one septic system or one biodigester is not going to solve the problems of a country with about 11 million people. However, by introducing these technologies and teaching people how they work, they can be replicated and spread throughout the country. On January 7th, 2018, I will be traveling to Les Cayes, Haiti representing BASH and the Haiti Capstone project with my fellow students Nicole Belanger, Owen Gannon, Austin Oliver, Chris Fraser, and alumni Maureen Kelly. I feel very nervous for what I am going to see, but hope that this experience will open my eyes to the problems Haiti is facing and what position I am in to help. More information about the housing unit, number of people using the system, amount of water used per flush, etc. We will bring tape measures, paper, pens, sieves, a scale, clipboards and whatever else we can fit in our backpacks and make it work. Welcome to the blog for the UMass Lowell alternative capstone class for civil and environmental engineering students, taught during the Fall 2017 semester by Linda Barrington, the service learning coordinator for the Francis College of Engineering, and by Prof. Onur Apul next semester. 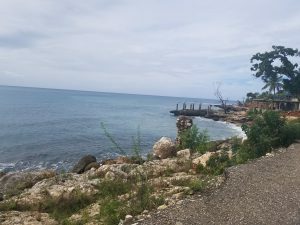 This trip is the latest effort in Haiti led by the group Engineers for Change, a student group that aims to make a difference in the world, and BASH (Biodigestor-Aided Solution in Haiti). 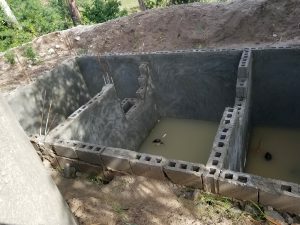 On a previous trip in January, 2017 to Project Hope (Pwoje Espwa), an orphanage located in Les Cayes, Haiti, to plan for a biodigester, the students learned that the orphanage needed septic systems. 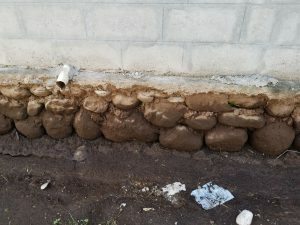 They decided to make designing and installing a septic system f.or one house in the orphanage their capstone project – and design it in a way that it could be replicated for other residential buildings. This trip is the first step in making that plan a reality. Follow BASH on Facebook and LinkedIn.